Chicken pot pie is one of my family’s favorite meals and this recipe, adapted from The Loaves and Fishes Cookbook, is the best one I’ve ever tried. Pot pie falls in my “10%,” that is 90% of the time I try to eat as whole and clean as possible, and the other 10% is what it is. 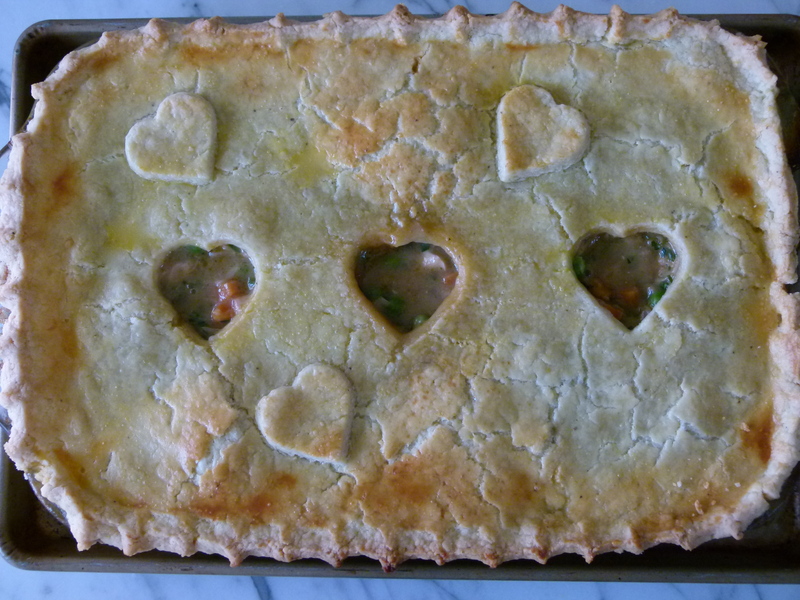 For the last 15 or so years, I have made pot pie once a year and when I do, my son always asks me, “is it a special occasion?” Many years ago, my younger daughter and I hosted a mother-daughter Valentine’s Day dinner at our home and we made a few of these pot pies with hearts cut out of the crust. Since then, we decided to make this our family’s Valentine’s Day tradition. Chicken Pot Pie is really comfort food at it’s best. It’s a perfect winter dinner and I’ve never met a chicken-eating child (even Mr. Picky) or adult that didn’t think this particular recipe was just delicious. Most pot pies are a blend of chunks of chicken meat and vegetables in a savory, tasty mixture and topped with a crust of sorts. Usually I make a savory pastry crust, but in a pinch I have made a drop biscuit batter and topped the casserole with that. Even though this recipe is pretty perfect as is, I think you can have equal success with leftover turkey, adding in different vegetables such as parsnips or turnips, or using store-bought pastry crust or puff pastry. 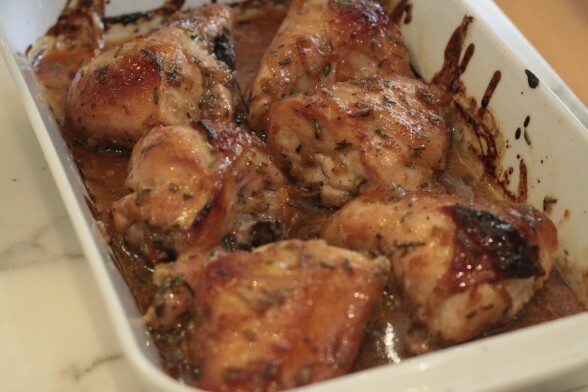 You can use pre-cooked chicken from a rostisserie or whole roasted chicken and shred the meat the day before. 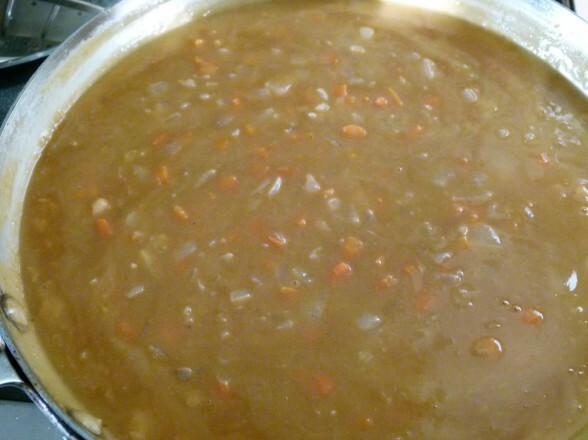 You can chop your carrots and onions the day before or make the entire filling the day before and pour it into your casserole dish and refrigerate it, covered until you’re ready to bake. You can make your pie crust a few days before. Allow it to sit out of the refrigerator for about 20 minutes before rolling it out. Or you can roll out the whole thing, lay it on parchment or plastic wrap and fold it in quarters to store it in the fridge. Pot pie freezes very nicely, well wrapped. It is best to thaw it for 24 hours in the refrigerator before baking. If you use store-bought crust, defrost the crust before laying it on the casserole. Puff pastry is also an easy way to cover the casserole. Follow the directions on the box. You can also use drop biscuits to cover instead of a crust. I actually debated whether or not to post Chicken Pot Pie at all since it is not completely consistent with both the way I eat and the kind of food I teach in my classes. But what I do try to encourage is cooking from scratch and with love and eating together as much as possible. And I think we can agree that there’s as much to gain from those habits as there is from vitamins and antioxidants. Check out the recipe for Salmon with Roasted Beets and Blood Oranges. You can make the recipe as is, or you can slice the cooked beets into 1/4-inch slices and cut out hearts with a heart-shaped cookie cutter. 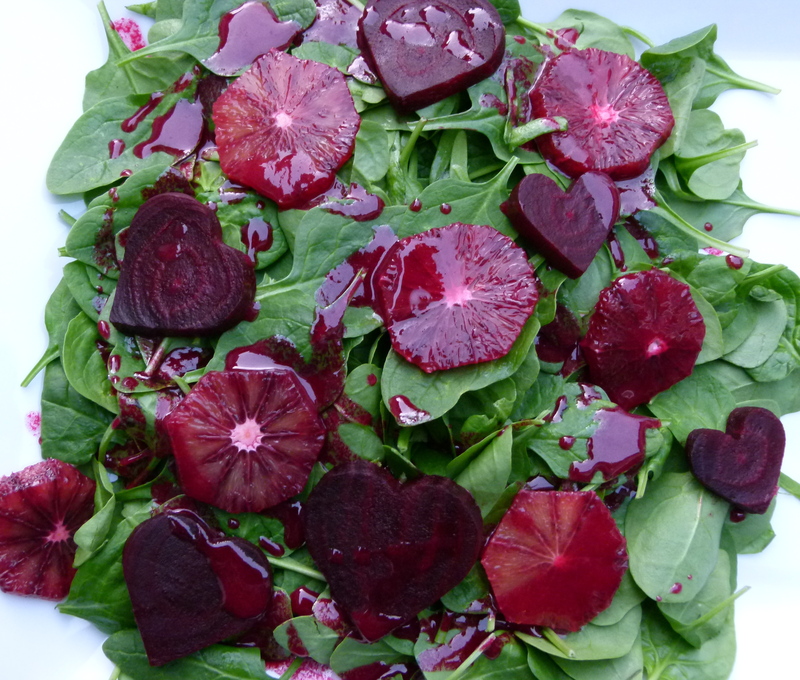 Heart-shaped beets are an adorable addition to any salad. See next idea for what to do with the leftover beet scraps. 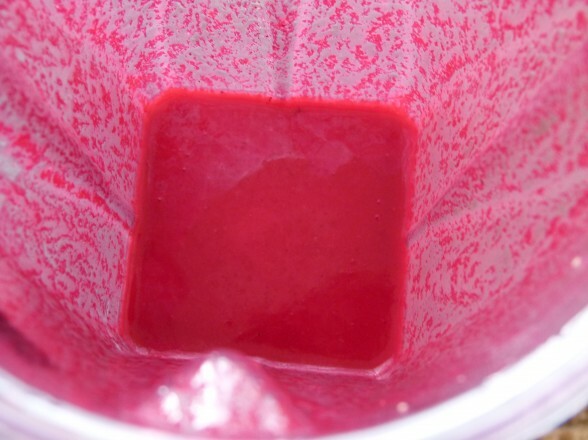 For a shocking, hot pink vinaigrette, place 1/4 cup of chopped, cooked beet pieces in a blender with your favorite vinaigrette ingredients and process until completely blended. Pick up some cooked beets from the supermarket salad bar to save time. In this picture I used Everyday Salad Dressing #2, but stirred in the shallots after the vinaigrette was completely blended with the beets. My kids freaked for it! Orange and Rosemary-Glazed Chicken — Easy, delicious and fool-proof. Serve with a rice pilaf with dried cranberries and a green vegetable like broccoli or spinach. Fish in parchment — Season halibut with salt and pepper. Add a dollop of pesto or slivered basil leaves and some halved cherry tomatoes. Serve with Lemon and Cumin-Scented Quinoa or roasted potatoes and sauteed kale or roasted cauliflower. Spice-Rubbed Wild Salmon served with baked sweet potato wedges and steamed asparagus with that fun pink vinaigrette. Whole Roasted Chicken — comfort food at its simplest. Serve with roasted root vegetables and green salad. Chicken Paillard — serve with roasted cherry tomatoes instead of fresh. Chicken Noodle Soup with pasta hearts — cook lasagne noodles and cut out hearts with cookie cutter. Add to soup. Raspberry Sauce — Make a simple syrup by combining 1/3 cup water and 1/4 cup sucanat, coconut palm sugar or natural cane sugar in a small saucepan over medium heat. Stir the mixture until sugar is dissolved. Place 5 ounces (about 1 cup) frozen raspberries and simple syrup in blender. Blend until smooth. Strain if you don’t like seeds. I like to serve the sauce with fresh raspberries on top of heart-shaped French toast, pancakes or ice cream. 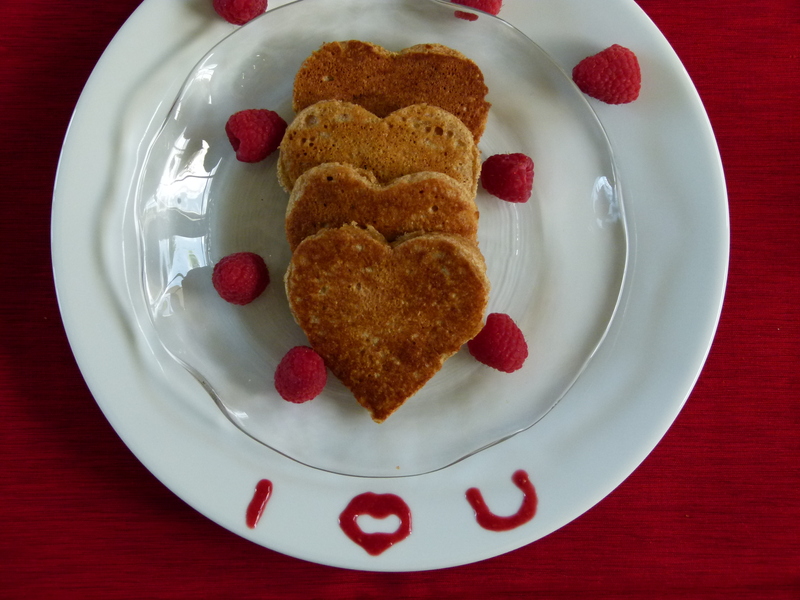 Heart-shaped pancakes are not realistic for more than two people. 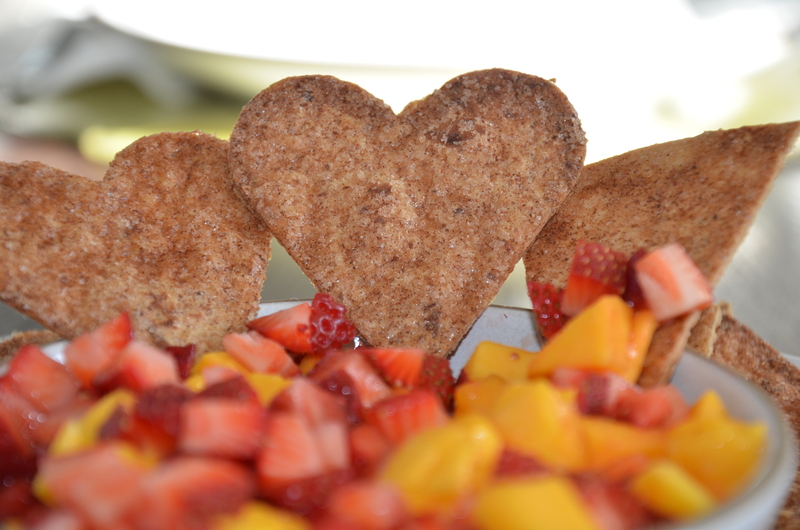 Heart-shaped French toast is great for a larger brood. Cut a heart out of a piece of bread for sandwiches or toast. 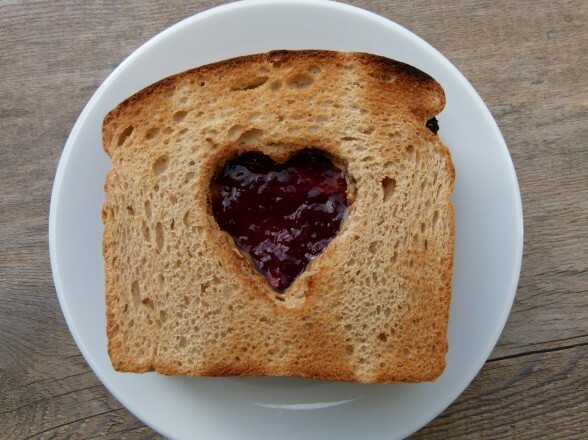 Toast the hearts and use as croutons. 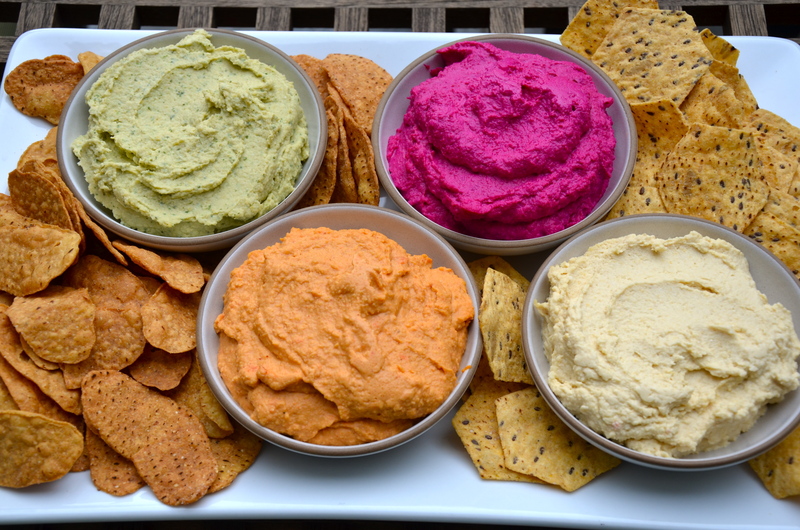 Hot pink hummus with heart-shaped chips — check here for how to make baked tortilla chips, but use a heart-shaped cookie cutter instead of cutting the tortillas into wedges. Same basic steps to make pita chips. Chocolate Fondue — Set a heat-proof bowl over a pan of simmering water. Add 12 ounces of chopped dark, bittersweet or semisweet chocolate and 3/4 cup heavy cream. Whisk until chocolate is melted. Serve with fresh strawberries, apple wedges, or chunks of banana. Always a hit for minimal effort! 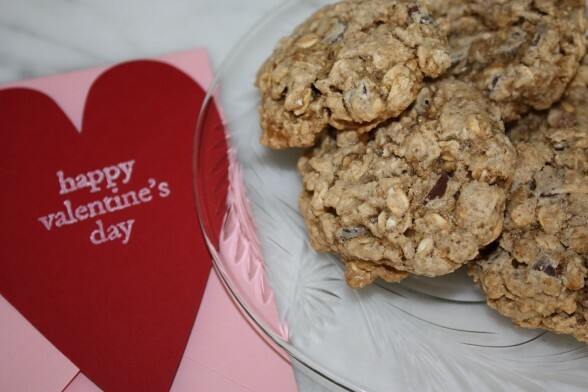 Chocolate Chip Oatmeal Cookies — makes a great Valentine gift! Do you have any favorite Valentine foods? Please share! 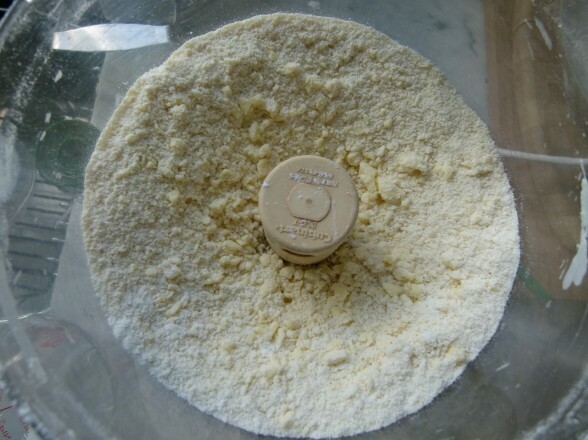 To make the pastry, place the flour, salt, pepper and butter in the bowl of a food processor fitted with the metal blade. Pulse 5 times. Add the lemon juice and water and turn on the machine for 3 seconds. Using your hands, scrape the dough onto a floured surface and work it together into a smooth ball. Cover with parchment paper or plastic wrap and chill for 30 minutes. To cook chicken: bring a large pot of water to a boil and add chicken breasts. Simmer for 7-8 minutes. Drain. Save the pot for later use. When chicken is cool enough to handle, cut into bite-size pieces and add back to pot. It is fine if the chicken is not cooked all the way through. Set aside. Heat butter in a large skillet over medium heat. Add onion and carrot and sauté until onion is translucent. Add the flour and sauté for 3 minutes over medium-low heat, stirring constantly. Add the salt and paprika. Mix well. Add the chicken stock gradually while stirring and bring to a boil. Stir in the Worcestershire sauce. Taste the mixture for seasoning and add extra salt and pepper if needed. 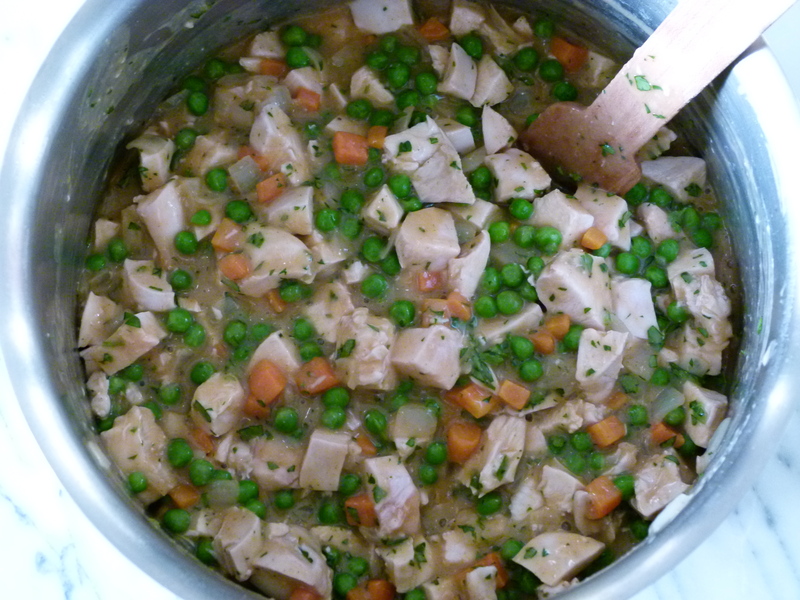 Add peas, parsley and onion-carrot mixture to chicken in the pot and combine well. Transfer to a 13 x 9–inch casserole dish. Roll out the pastry dough 1-inch larger than the area of the casserole dish. Cut hearts from the dough with cookie cutter, if desired, otherwise make a few small slits in the dough for steam to escape. Place the dough on top of the filling and crimp the edges. Beat the egg yolk with the cream and brush the top of the pastry with the mixture. Place dish on top of a baking sheet and bake for 50-60 minutes or until golden brown. You can cut this recipe in half and bake it in an 8 x 8-inch pan. You can also make individual pot pies in oven-proof bowls or large ramekins. 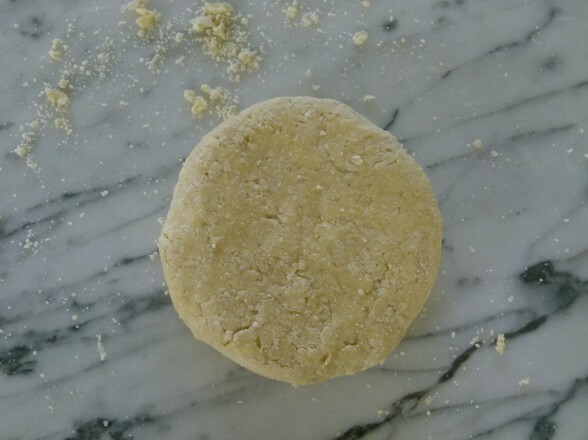 Pamela – to make the crust gluten free, is it a simple cup to cup ratio of flour to GF flour? Also, I used gf worcesteshire in a marinade the other day and it was a bit salty. Do you know if that too is a 1:1 ratio when subbing, or if gf Worcestershire is more salty than regular? Thank you! Yes, but I would advise rolling the pastry dough in between two pieces of plastic wrap or parchment paper. I have normally substituted GF worcestershire sauce 1:1 with regular and had no issues with saltiness. 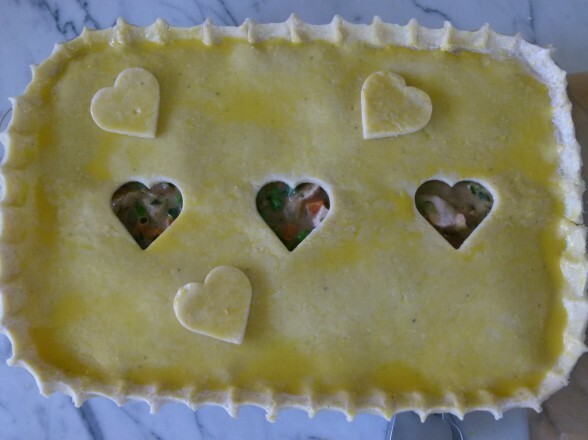 I would like to make this chicken pot pie when I have time but then freeze it for when I have company. How do I do that? Any special instructions? Assemble the casserole with the crust on top. Add the egg wash or don’t — either is fine. Cover tightly and freeze. Pull it out and defrost in the fridge all day or overnight. It takes way too long to bake going from freezer to oven! Uncover, brush with egg wash if you haven’t done that, and bake according to the recipe. If it’s cold, it may need an extra 5-10 minutes. It should be bubbling and the crust golden. Oh My God, this chicken pot pie was so delicious. My family was hesitant to try it since I made it as the whole “meal”…What do you mean you put all of the vegetables, starch and meat in one pan???? But, everyone loved it and it was delicious and hearty but not too heavy. Pamela, truly, you are fabulous! thanks for sharing with us lucky mere mortals. Teddi, you’re over the top! Get your family used to one pot meals once in a while — so much easier for you! Thanks so much for adding your GF knowledge, Peggy. You’re the queen! You’ll love the oatmeal cookies — GF and vegan! I love your recipe for the chicken pot pie. It is something that I am going to try. I also loved your pancakes and your hot pink dressing! Is there a way to do the pot pie GFCF? when I experiment..Its always average tasting..
Good question! I am sure you could do this with earth balance sticks to sub for the butter and a GF flour for the all purpose. Or just buy a pre-made GF pie crust from whole foods and use that on top and rice flour in the filling. I would love to to make the chicken pot pie. Is there any way to make a non-dairy version of this? Okay, you had me at chicken pot pie. SO delicious! I will definitely have to try this. But -then- you added a recipe with roasted beets and blood oranges? Two of my favorite things in the world, seriously! I have always loved beets, and I can’t stop eating blood oranges when they come in season. Finally, the oatmeal cookie with chocolate chips? Home run! LOVE these ideas! Ha! I think I did my job — you sound inspired. Have fun! Love all the heart- shaped ideas. Will definitely make the heart pancakes and tortilla chips!! Your family will love them! Tip about pancakes — I greased the inside of the mold before I poured batter in and I encourage you to use less batter than you think you need otherwise they’re too thick. They turned out really cute.